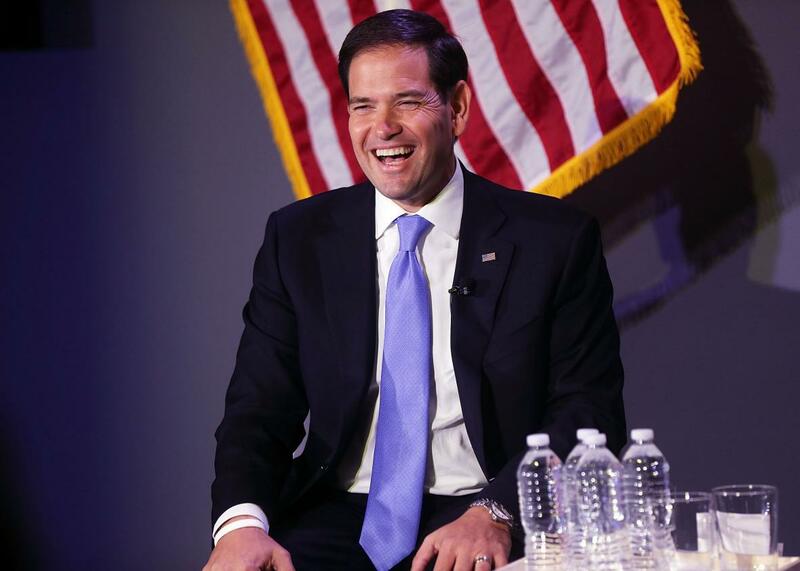 Marco Rubio picks up Senate endorsements, Paul Singer’s cash. Pundits Have Long Been Saying Rubio Is on the Rise. Now There’s Finally Some Evidence to Back That Up. There’s a reason he’s smiling. Marco Rubio speaks at Civic Hall about the ‘sharing economy’ on October 6, 2015 in New York City. Maybe this is what actual momentum looks like. Daines and Gardner are both freshmen senators who took office this year, so their endorsements by themselves won’t move the needle too much. They do, however, represent some tangible evidence of the “momentum” that many establishment pundits have been ascribing to Rubio since he turned in his second strong debate performance last month at the CNN debate in Southern California. As I’ve previously noted, such talk of a post-CNN-debate “surge” was more speculative than supported during the weeks after that event: Rubio picked up a few points in the national polls, yes, but he still hadn’t rebounded to where he had been entering the summer of Trump; his third-quarter fundraising was overshadowed by larger hauls from his less traditional rivals; and, for an establishment favorite, he didn’t yet appear to be the favorite of much of the establishment. But following an even better-received performance during last week’s CNBC debate—paired with Jeb Bush’s widely panned performance on the same stage—we’re finally starting to see evidence that Rubio is actually on the rise. In addition to Daines and Gardner’s backing, Rubio also recently picked up the formal backing of two House Republicans. Thanks to those four endorsements—the only ones made by GOP lawmakers or governors in the past two weeks—Rubio has now climbed to fourth in FiveThirtyEight’s endorsement tracker, which weighs endorsements by the relative importance of the endorser’s office. It’s still early in the endorsement race—only nine Republican senators and four GOP governors have declared for a candidate so far—but Rubio’s made gains from this time last month when he sat in eighth (and behind Lindsey Graham). More important for the candidate was last Friday’s news that Rubio had picked up the backing of billionaire Paul Singer, a GOP super-donor who has a history of not only spending big on his favored candidates but also getting his deep-pocketed friends to open up their wallets. Singer’s support suggests that Rubio’s fall will go much better than his summer did. Rubio, though, will have to wait a little longer to see if GOP primary voters follow the lead of Republican politicos, establishment-minded powerbrokers, and Washington pundits. The three most recent national polls—which were conducted mostly before CNBC’s Oct. 28th debate ended—showed Rubio holding relatively steady, and definitely not in the lead. In the latest Wall Street Journal/NBC poll (conducted Oct. 25–29), the Florida Republican was at 11 percent, down two points from where he was two weeks earlier, the previous time those pollsters asked the question. In the latest Investor’s Business Daily/TPP survey (Oct. 24–29), he was at 11 percent, unchanged from the same poll taken at the end of September. And the latest Ipsos/Reuters poll (Oct. 24–28) had him at 6 percent, unchanged from the previous week.